Kate Middleton dazzles in Alexander McQueen for Victoria departure | HELLO! 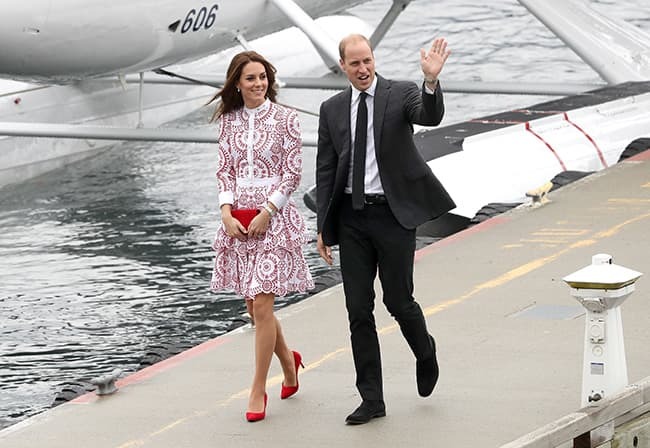 The Duchess of Cambridge, née Kate Middleton, chose a standout look for the start of her second day in Canada, stepping out in a striking pleated dress to board a seaplane from Victoria Harbour with Prince William on Sunday. The £4,000 dress, by Alexander McQueen, featured intricate embroidered detail, a high-neck collar and a knee-length skirt, highlighting the Duchess' slender frame. It might have been created by a British designer, but thoughtful Kate had selected a garment in the colours of her host country - red and white. The elegant royal further accentuated her outfit with a bright red suede heels and a matching clutch bag. She wore her perfectly-styled tresses around her shoulders in glossy waves, and highlighted her striking facial features with subtle tones of makeup, including a touch of blusher to her cheeks, and a soft pink lip. The royals, who arrived in Canada for their official tour on Saturday, are travelling to Vancouver where they will be greeted by dignitaries from the city. The first stop on Day 2 of their visit will be a tour of Sheway, a program that provides health and social service support to pregnant women, and women with infants who are dealing with addiction issues. They will then visit the Immigrant Services Society of British Columbia where they will meet people recently relocated from Syria through the UNHCR. The Duke and Duchess of Cambridge will also attend a reception to celebrate young Canadian talent before they end their day at the Canadian Coast Guard at Vanier Park.